National Thai Elephant Day was established by the Thai government in 1998. It's annually celebrated on March 13, the anniversary, when the white elephant was added to the old version of the Thai flag. Elephants have always been a part of the history of Thailand. Despite elephants are protected in Thailand, their population is vastly declining during the last century. Nowadays, about 3,000-4,000 elephants live in Thailand, most of them are held in captivity. A special celebration is organized on National Elephant Day about 80 km away from Bangkok, the capital of Thailand. A vast spot is decorated, where elephants have a buffet food. Everyone can participate the celebration for free. Another event of the holiday is a traditional blessing ceremony and a special elephant show. This holiday attracts many tourists, who can show respect for these magnificent animals. 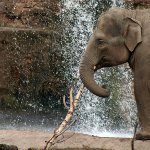 National Thai Elephant Day helps raise public awareness of protection and conservation of elephants. Their population is declining due to many factors, like climate change, habitat deconstruction and poaching.